The thought of video game adaptations in film or anime usually leads one to imagine the more frequently popularized aspects of video games: Stylish violence and sensuality, high-velocity, no-holds-barred plotlines with worlds that need saving, and iconic, stone-faced heroes and heroines. Atelier Escha & Logy, an adaptation of one installment in a series of well-received roleplaying games, is about as far removed from that generalization as possible—its heroes and heroines are not particularly adept, and its focus drifts towards some of the more humble aspects of gaming, such as navigating the environment, gathering resources, communicating with other characters, and gradually honing skills. The idea is respectable, but the result here is a slice of fantasy life that is calm and benign, but also difficult to become invested in. It is immediately clear that, whatever other virtues Escha & Logy might possess, a budget isn't one of them. Put bluntly, this show screams “cheap.” The backgrounds lack any noticeable texture or detail, and are reused frequently. The character art, while usually not too bad up close, can sometimes stray wildly off-model at a distance. The animation, bordering on cut-rate to begin with, actually degenerates in quality as the episode count mounts, until fight scenes or even just scenes of quick movement are nothing more than montages of still-frames. A simple lack of production values can, of course, be overcome by visual creativity, and a show with this much whimsy seems like a prime candidate for such a treatment, but a series of poor design choices prevent it from happening. Perhaps handcuffed by a desire to remain true to the game's image, the character designs here are about as typical as a fantasy can get—a witch is a girl with a hat riding a broom, a warrior is a bulky dude with a sword, and so on. Color, however, is the biggest obstacle to my saying this show looks anything but mediocre; the palette is painfully light in tone, with soft yellows, whites, and reds in huge numbers, and even its dark colors look bleached and faded, resulting in a uniformly washed-out blur of pastels. In general I'd rather not beat up a series for its looks, but there simply isn't a lot of room for compliments when something looks both creatively bankrupt and technically inept. The music, however, manages to slightly bolster the technical side of the series. It's difficult to pin down the vibe emitted by the show's setting—vaguely steampunk with numerous elements of medieval fantasy—so the soundtrack wisely paints in broad strokes, from soft modern orchestral to anthemic rock to Celtic-sounding folk music. Though it doesn't contribute much toward an overall sense of consistency, this scattergun approach works surprisingly well on a scene-to-scene basis; the score is a little too typical at times, perhaps, and a little too overwrought at others, but at any given moment the odds that it's complementing whatever is happening onscreen are solid. Escha & Logy's world is a barren one in which human settlements are ringed by The Land of Dusk, a wasteland of cliffs, deserts, and dry, cracked soil which cannot sustain plant life. Civilization has resorted to the research of alchemy in order to restore the desolate land to a more hospitable state, and main character Escha, who lost her mother when she was a child, is the last in a line of alchemists. Raised by the automaton Clone in the tiny frontier town of Colseit, she has joined her town government's research and development branch in order to assist with alchemical development and various expeditions into The Land of Dusk. There she meets Logy, an alchemist from a much larger city who has been sent to assist the Colseit branch in their adventures. The conceptual high points of the show are revealed early on—Escha's personal history merging with the history of alchemy and the battle to restore The Land of Dusk to a fertile state is a curiosity-piquing idea. Some scenes, such as the revealing of the town's generations-old, hand-tilled apple orchard, have a sort of modest grandeur. The lone spot of noble green in the wasteland, made possible only through hundreds of years of human effort and sacrifice, seems like a tiny hint at what Escha & Logy is about: The little ways in which we choose to fight ruination, be it within ourselves or within the world. Initially, the skeleton of a story seems to be in place. Unfortunately, it soon becomes apparent that a skeleton is all that it is. Escha & Logy is quick to talk at length about anything but its overarching plot, instead diving into a series of episodic shenanigans in which the eponymous pair explore old ruins or meet the many denizens of Colseit and help them through personal problems. They help a local swordswoman through a quarrel with her sisters, help a local witch capture a fire spirit, help a local girl with a wish to make medicine. The more the list goes on, the more disconnected the show begins to feel from what could have been its strengths—the dusky world eventually looms like a forgotten backdrop rather than an essential element, and the two main characters eventually seem more like walking panaceas who exist to provide conclusions for the stories of others rather than humble, newly-minted researchers with goals and motivations of their own. The arc which concludes the series seems like a slapped-together combination of all the standalone adventures, a desperate attempt to prove that there is, in fact, a narrative thread holding the show together. There isn't, though. A mindless amalgamation of supporting characters piled on top of a final objective does not a story make. That doesn't mean the series has nothing to offer. As far as simple, lazy, Sunday afternoon entertainment goes, one could do a lot better than Escha & Logy, but one could also do a lot worse. It's innocent enough in content, and each adventure can occasionally offer a tidbit of humor or a tidbit of genuine cuteness. There are men and women who need saving, pies that need baking, petite dreams that need to be reached. All of that has a certain charm. The series bumbles along, but, other than failing to capitalize on the potential of its own ideas, makes no great transgressions. There's nothing particularly malignant about it—the average episode is just a warm and fuzzy (if shallow and predictable) little story which might serve as that most basic type of escapist entertainment, vapid and insubstantial, but mildly pleasant and passable as a brief distraction. Ultimately, though, watching Escha & Logy feels a little too much like watching someone else play a video game, with each episode a quest. You can practically feel the boss at the end of the dungeon approaching, or the pop-up box of success when a character is helped. Simply by virtue of its constant movement from place to place, such a thing might draw the attention of the eye and the brain for twenty minutes. But when it's over, you'll take whatever miniscule reward it offers, walk away, and, hours or days later, forget that the whole thing ever happened. So everyone knows this is based on game series and yes, it's not that easy to understand the whole thing without playing those games. Yet it doesn't mean that you won't be able to enjoy this anime at all. Even if you're not familiar with games, there's a certain aura to this anime that you can enjoy it as well as others do. Story 7/10 - isn't anything too complicated, it's rather easy-going, may feel a little slow-paced but that's just the nature of this anime. There's nothing much to talk about story actually, most of the episodes are concentrated on individual characters. They don't go really too much into background and keep it easy to understand. Art is quite good, you can just see that on your own~ but it's nothing to great either so it's 7/10. Sound - well, it's all about taste I say, 8/10 for really relaxing osts. Characters - nothing too complicated here either, most of them are easy to understand/guess what kind of characters they are. Still they're rather enjoyable bunch of... "people." ( not all of them are humans) 6/10 because there's nothing really unique here. Enjoyment - this is the key part of this anime, if you like animes like Aria for example, slow, relaxing, peaceful, than this is for you. Even battle scenes won't get you worked up. You can just turn this on and relax from a tiring day. Some of course can't really enjoy this kind of entertainment, but for some it's a rare opportunity to go into a fascinating fantasy world, where you enjoy every second you spend. Overall I give this 7/10. People who enjoy this kind of anime, should definitely watch this, and for people who're looking for fantasy world filled with action, keep looking, this one isn't for you. That pretty much sums up the moral that the anime teaches in a sense. Although not many reviews or others have really focused on the what anime can teach someone.. but personally I think it is rather important to at least touch on it because it is something that many people overlook. Many people underestimate the power of anime. Escha & Logy no Atelier is an example of a pretty standard anime that centers around the idea of "Don't give up on your dreams". The art overall was amazing just like any anime these days. There were a few scenes where the animation does glitch in a sense. Example- when it was Escha holding the envelope and then the next scene Logy has it all of a sudden. But otherwise it was amazing in terms of colour and art. There were two songs that stood out to me from this anime. The opening theme was good in terms of how it fits with the anime. Also the piano theme that comes out whenever something sad would happen was also pretty suiting. However I wouldn't say it has a masterpiece soundtrack like Clannad, Guilty Crown, FMA, and Angel Beats. Or anything extremely catchy like Binbougami ga! or Melody of the Wild Dance from Bleach. The voice acting in anime as usual always impress me. The voices suited their character, I can't imagine Escha's voice sounding like Clone's voice xD..that would be different. Ok..here is the part where I found that this anime had problems with. However I don't want to discredit the character set-up, which was very suiting and I thought was well planed for this type of anime. But there was little to no character development in this anime (although it is hard with 12 episodes). To kind of put in context. -> then becomes Care free, Airhead, Kind, and still skilled in alchemy. Logy: Resolved, Mature, Strong, Caring, Smart (you'll get why if you watch the anime) he then becomes... EVEN MORE RESOLVED, mature, strong, caring, and still smart. Ya.. I liked it.. it was a fun anime to watch if you don't want to watch anything really intense. But I think if you can get passed the rushed plot Escha & Logy no Atelier brings some interesting aspects and I wished they would have developed it more. 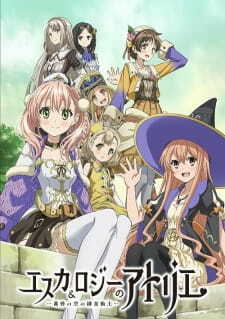 Although the story may be told in a different way, the anime adaptation of Atelier Escha & Logy is by all accounts a solid and competent one; as an avid fan of the game I can vouch for that- allow me to explain. The story of Escha & Logy is but a simple story centered primarily around the themes of cooperation, ambition, caring for the natural environment and the perils of the unbridled lust for wealth. In fact, such are the themes that deeply pervade the Dusk series in the Atelier franchise of video games. However, what differentiates this anime adaptation from the video game is that the game focuses more on establishing and developing the setting of the world of Dusk while less so on the individual characters themselves. The characters themselves do have many interesting, heart-warming and heart-felt moments, but they are all ultimately overshadowed by the melancholic bleakness of the seemingly never-ending Age of Dusk which has continued to go on for many millennia. Which contrasts it with the anime, whereby the story instead places greater emphasis on the characters and how their individual motivations are deeply connected to the aforementioned themes; thus, while the games are a fair bit more complex as it seeks to further elaborate upon the world of Dusk, the anime's story line is more simplified and the core themes of the Dusk series are constantly reinforced via individual plot points that are developed based off the characters for a thematically stronger, more concise narrative. This is true for the tone of the narrative as well, for just as the games are bleaker and much more melancholic and aims to inspire awe at the grandiosity of the ancient alchemic civilization, the anime is much more lighthearted and optimistic in return. In regards to the overall scripting of the anime, many events and character arcs have been rewritten to a significant extent in order to promote this alternative narrative focus. The anime features many original and altered plot points that are actually creative, well-constructed and cohesive while paying homage to the first 2 games. The anime also features additional lines of dialogue that are exclusive to the anime, as well as integrating many lines that were originally found within the game and reworking some of them to better fit the altered events and character arcs. And while this does lessen the poignancy of several plot points within the game, the anime however manages to compensate for that by ensuring that its new and altered plot points and dialogue are up to par and faithful to the source material. Very impressive work indeed, I must say. The visual qualities of the anime adaptation are well-made and many of the artistic designs from the game are faithfully recreated and adapted. This can be found in some of the backgrounds which feature solid watercolor and pastel work. In general, the color scheme of the anime is much lighter and softer than what can be found within the game where it is very deep, rich and vibrant, but this change in color scheme helps to further accentuate the lighthearted tone that the anime adaptation opts for- thus sufficiently differentiating it from the game and providing it a distinct identity. Animation wise, the show is overall decently-animated with hand drawn and computer-rendered animation being used in tandem. The hand drawn animation is rather decent, however it frequently suffers from characters being off-model when they're portrayed at a distance (especially the details on their faces- eyes specifically), but the computer-rendered animation on the other hand is surprisingly well-made and very well integrated with the aesthetics of the show, wherein it adopts the same color scheme. There's no choppiness in the frame rate of the computer-generated models either which only serves to enhance the seamlessness of the viewing experience- minus the off-model characters. The particle effects, lighting effects and camera work overall are also well-done, and can be quite impressive at times. The shot composition and editing of the material is very creative in several scenes, but can sometimes be uninspired or sub par during conversational scenes where the characters are mostly static. Finally, the OP sequence is easily the best animated aspect of the show, what with fluid animation, energetic editing, and stellar camera and effects work. The ED sequence however is slower-paced, focusing on developing a calm, wistful atmosphere when an episode comes to an end. And therefore based on the points that I brought up, I can unreservedly say that this adaptation is without a doubt, competently produced... Just work on those faces alright? Please? The sound design in the anime adaptation is well-done overall. Sound effects are very varied and adequately depicts the action on screen, in addition to being professionally made. The anime's approach to the soundtrack on the other hand consists of original material that are faithful to the style of music found within the more recent Atelier games, in addition to incorporating a few of the tracks found within them as well. The voice acting is once again well-done with the voice actors from the game reprising their roles in the anime adaptation. There are simply no complaints in that regard or even to the overall aspect of the sound design, for the standards are high and the quality assured. To conclude, I would like to express that I personally found this adaptation to be quite enjoyable, and am delighted that it's a creative and well-made alternative retelling of the overall story of the video game. It's just that perhaps due to many constraints, the anime adaptation was just simply unable to greatly expand upon and incorporate both the character-focused and setting-focused narratives into a larger whole. This is disappointing but regardless of such constraints, I can very easily recommend this anime to anyone who's a fan of the Atelier games or even to those who are interested in history and fantasy in general. And with that, I shall bid all of you farewell and thank you for reading- till next time then! P.S. : I have stopped using the 'Characters' dimension as a separate category of analysis in my reviews, as I have found it to be redundant since incorporating discussions on character design as part of the first analytical category.